King Oceiros is the former king of Lothric. He was obsessed with “harnessing his blood for a higher purpose”, which may have been to produce an heir to the Lothric throne that would validate the Royal bloodline to some degree. To this end, he was willing to ally with the heretics of the Grand Archives. The scholars introduced Oceiros to the worship of the Paledrake, Seath the Scaleless. Oceiros was fascinated by dragons, and eventually became obsessed with them, to the point of losing his sanity, and as a result he became known as the Consumed King. He has the habit of always carrying with him a ring made from a dragon scale — a material known as the source of immortality for the Everlasting Dragons. This ring granted him resilience against the many assassins sent to kill him — or so he believed. 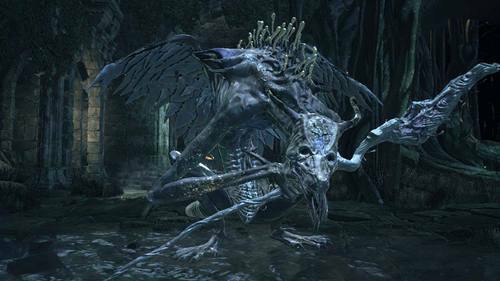 When you meet Oceiros in a cavern at the far end of the Consumed King's Garden, he has been made into a strange half dragon creature. This seems to have occurred because he studied the work of Big Hat Logan, who had been similarly consumed by his research into Seath’s knowledge. Similar to how Logan never really understood dragons, Oceiros would be unable to fully understand the magic of moonlight; the Moon is intimately linked with magic, just as faith is linked to lightning. And, also like Logan, this knowledge that existed just beyond his fingertips drove Ocerios mad. Also worth noting is that Oceiros’s attempts were not well received. In all likelihood, he neglected his country, or otherwise drove it to ruin. He was, after all, called a mad king later in life. His opponents would attempt to have him killed many times, but never succeeded. Ultimately, Oceiros believes that he has succeeded in his attempts to uplift his blood with the power of dragons, with his last son, Ocelotte, though it is unclear if he actually did. During your battle with him, he begins by saying “Oh, you ignorant slaves… finally taken notice have you? Of the power of my beloved Ocelotte, child of Dragons. Well, I will not give him up, for he is all that I have.” Ocerios seems aware of all that he has lost, but believes it has been validated by his last child. But why was Oceiros so driven to the idea of harnessing his blood for a higher purpose? The royal family was obsessed with creating a worthy heir, but for whatever reason, this was impossible for them. It is implied that there is some relationship between the Queen and the line of Gwyn, so it may be that they wanted to finally produce a heir that would properly link the fire, and succeed where Gwyn had failed. He may have gone senile or mad with age and isolation. His dialogue mentions there is a child called Ocelotte; and he cradles something, as if he were holding a child, though nothing is seen; yet as you smack him around, he tells Ocelotte to come out, as if just realizing that Ocelotte isn't in his hands, and now he himself doesnt know where Ocelotte his. Perhaps he rememebers somthing painful, as when you smack him around further, he screams the name of Ocelotte and becomes a frenzied beast, no longer human. Oceiros seemingly loses track of the baby during the fight, but it's also quite likely that he's just having a lucid moment where he realizes he's holding nothing. "Ahh, you ignorant slaves. Finally taken notice have you? Of the power of my beloved Ocelotte, child of dragons. Well, I will not give him up. For he is all that I have." Where have you gone? Are you hiding from me? Come out, come out, don't be afraid. You were born a child of dragons, what could you possibly fear? Now, now, show yourself, Ocelotte. He seems to scream "Ocelotte!" whilst becoming feral like. In the Japanese subtitle, he saids "Kyyaaaaaaaahhhh!". "Ignorant slaves, how quickly you forget." Ring of Oceiros, former king of Lothric. In his later years, Oceiros became fascinated with dragons. After going mad, he was more commonly known as the Consumed King. Many assassins were dispatched to his domain, but none returned. The Consumed King ascribed his resilience to the divine protection of the dragon scale. […]Oceiros went mad trying to harness his royal blood for a greater purpose, leading him to the heretics of the Grand Archives, where he discovered the twisted worship of Seath the paledrake. […] Emits crystal breath of Seath the Scaleless. […] Seath's research seemed to strike a chord with old Big Hat who, in his mad, disrobed state, made divine works such as this, his own. Oceiros was no doubt edified by this. Legendary dragon weapon associated with Seath the paledrake. […] Oceiros, the Consumed King, was infatuated with the search for moonlight, but in the end, it never revealed itself to him. […] The Lothric Bloodline was obsessed with creating a worthy heir, and when this proved impossible, resorted to unspeakable means. Suffice it to say, the path to Linking the Fire is a cursed one indeed.